In October 1992, Apple introduced two updated PowerBooks, a new PowerBook Duo series, and the last members of the Macintosh II family. You couldn't ask for a greater contrast. Apple introduced System 7 in May 1991, making multitasking part of the Mac OS. The first 68040-based Macs, the 25 MHz Quadra 700 and 900, were introduced in October 1991, as were the first PowerBooks. System 7.1 came out in 1992, the 33 MHz Quadra 950 came out in May, and the 25 MHz PowerBook 145 replaced the 140 in August. After introducing the first "low cost" Macs in October 1990, Apple decided to pursue the consumer market with a new brand. 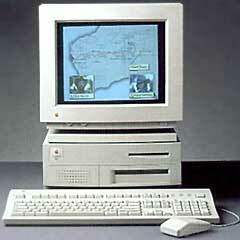 The Performa 200, 400, and 600 were introduced in Sept. 1992. The first was a renamed Classic II, and the second was a repackaged LC II. 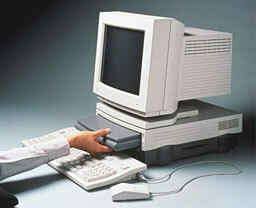 The Peforma 600 was a new design, and also the first Mac with a built-in CD-ROM drive. AppleDesigned a new case for the Performa 600, one with room for an internal CD-ROM drive. For the first time, the top and bottom of the computer were made of metal. The power supply, floppy drive, and dimensions of the motherboard matched those of the Mac IIcx, IIci, and Quadra 700, all of which had shared the same molded plastic case. In terms of specs, the 600 looked like a winner: a 32 MHz 68030, three NuBus expansion slots, room for 68 MB of RAM, and a 2x CD-ROM drive. What it lacked didn't seem important for the home market: There was no math coprocessor (although one could be added) and it couldn't take a Level 2 cache card. On October 19, Apple unveiled the Macintosh IIvi and IIvx, which used the same enclosure as the Performa 600 - one that would later be used by the Centris 650, Quadra 650, and Power Mac 7100. The IIvi, never marketed in the US, was Apple's low-end Mac II with a 16 MHz CPU, and it offered comparable performance to the 1989 Mac IIcx. The Mac IIvx was a disappointment. Until this time, the Mac II line had been Apple's professional range of computers, starting with the 1987 Mac II and topping out with the 40 MHz Mac IIfx in 1990. The IIvx was a very compromised design, running a 32 MHz CPU on a 16 MHz bus. Reviewers quickly discovered that this was just a slightly upgraded Performa 600 with a math coprocessor and 32 KB of Level 2 cache. Although the IIvx was intended to replace the aging Mac IIci (1989-93), benchmark results showed the 32 MHz model was slower than the older 25 MHz one! Where the IIci was rated a 4.3 times as powerful as the Mac SE, the IIvx was rated at only 2.7 because the entire design was hobbled by its 16 MHz data bus. Of the two dozen Macs given the "Road Apple" designation, only one is categorically worse - and the Performa version was a bit worse. Thes were the first PowerBooks to support more than 8 MB of RAM; they had a 14 MB memory ceiling. They also reintroduced SCSI Disk Mode, a feature from the PowerBook 100 that hadn't been included on other PowerBooks until now. The PowerBook 160 had a 25 MHz 68030 CPU, 4 MB of RAM (a lot in those days), a 40 MB or larger hard drive, and a passive matrix grayscale display. It sold for a bit under US$2,500. The PowerBook 180 was the new top of the line, built around a 33 MHz 68030 (the earlier PB 170 was 25 MHz) and a 4-bit active matrix display. It sold for over US$4,000 with an 80 MB hard drive. The PowerBooks had been innovative; their design with the trackball ahead of the keyboard quickly became the norm. But some people didn't want to haul around 6+ pounds of laptop computer. For them, Apple created the PowerBook Duo line, which didn't have a built-in floppy drive. Each model weighed just 4.2 pounds, and their footprint was just a bit smaller than a sheet of 8.5" x 11" paper. They were roughly 35% thinner than the full-sized PowerBooks. The PowerBook Duo 210 was a match for the PowerBook 160: 25 MHz 68030, 4 MB of RAM, 80 MB hard drive, 640 x 480 4-bit passive matrix display. Memory could be expanded to 24 MB, even more than the full-sized PowerBooks, and it had no floppy drive, no ADB port, and no SCSI connector; instead it had a dock connector. The PowerBook Duo 230 took the same design and used a 33 MHz 68030 CPU and an active matrix display. It used the same DuoDocks as the 210. By putting the floppy drive, ADB port, SCSI port, and video-out port in an external device, the Duos were smaller and lighter than traditional notebooks - yet equally flexible on the desktop. Our own Charles Moore has written an excellent overview of the PowerBook Duo family, which survived into the PowerPC era, and Apple's DuoDocks. Six new Macs: Four hits, two misses. The Mac IIvi and IIvx are generally forgotten, along with the Performa 600, which is as it should be. Some designs are just too compromised or dated. But Apple innovation paid off with the improved PowerBooks and the PowerBook Duo series. Even today Mac users clamor for a 4 pound notebook, and today's MacBook weighs a full pound more than the two Duo models introduced 15 years ago.